Respiratory failure is inadequate gas exchange by the respiratory system, with the result that levels of arterial oxygen, carbon dioxide or both cannot be maintained within their normal ranges. A drop in blood oxygenation is known as hypoxemia; a rise in arterial carbon dioxide levels is called hypercapnia. The normal partial pressure reference values are: oxygen PaO2 more than 80 mmHg (11 kPa), and carbon dioxide PaCO2 lesser than 45 mmHg (6.0 kPa). Classification into type I or type II relates to the absence or presence of hypercapnia respectively. Hypoxemia (PaO2 <8kPa) with hypercapnia (PaCO2 >6.0kPa). Deformed (kyphoscoliosis), rigid (ankylosing spondylitis), or flail chest. Treatment of the underlying cause is required. 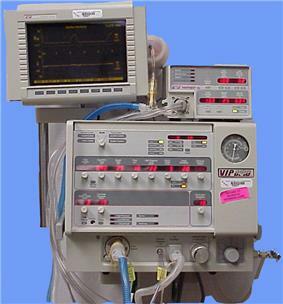 Endotracheal intubation and mechanical ventilation are required in cases of severe respiratory failure (PaO2 less than 50 mmHg). Respiratory stimulants such as doxapram are rarely used, and if the respiratory failure resulted from an overdose of sedative drugs such as opioids or benzodiazepines, then the appropriate antidote (naloxone or flumazenil, respectively) will be given. There is tentative evidence that in those with respiratory failure identified before arrival in hospital, continuous positive airway pressure can be useful when started before conveying to hospital. ^ a b Burt, Christiana C.; Arrowsmith, Joseph E. (1 November 2009). "Respiratory failure". Surgery (Oxford) 27 (11): 475–479. ^ Bakke, SA; Botker, MT; Riddervold, IS; Kirkegaard, H; Christensen, EF (22 November 2014). "Continuous positive airway pressure and noninvasive ventilation in prehospital treatment of patients with acute respiratory failure: a systematic review of controlled studies.". Scandinavian journal of trauma, resuscitation and emergency medicine 22 (1): 69.